Starwood Preferred Guest (SPG) members residing in Ontario or Quebec can get up to 15% discount off of the Best Available Rates in those two states provinces until December 31, 2014. The terms state that this offer would be available for Thursday to Sunday arrivals, but many hotels appear to be offering it 7 days a week. The discount at the W is just 10% when the generic AAA rate is discounted by 15%. This rate can work if there are no discounted rates available for the dates in question. AAA or sale rates are likely better deal, however. 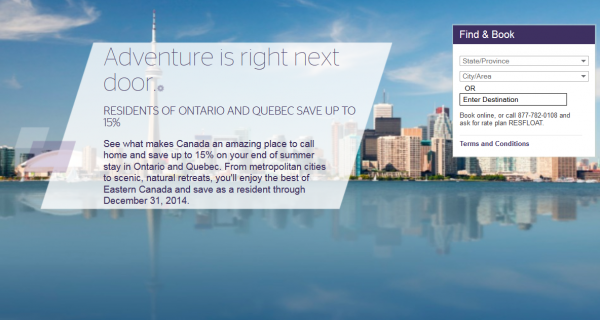 Offer is valid at participating Starwood Hotels & Resorts in Quebec and Ontario. Offer valid for Thursday-Sunday arrivals through December 31, 2014. Offer only available for residents of Quebec and Ontario provinces; guest must present valid government-issued photo ID at check-in in order to receive these exclusive rates. For reservations booked by phone, Quebec and Quebec residents must quote rate plan RESFLOAT. Offer components and restrictions vary by property; see individual property terms and conditions for complete details.